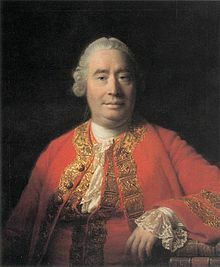 In every system of morality, which I have hitherto met with, I have always remarked, that the author proceeds for some time in the ordinary ways of reasoning, and establishes the being of a God, or makes observations concerning human affairs; when all of a sudden I am surprised to find, that instead of the usual copulations of propositions, is, and is not, I meet with no proposition that is not connected with an ought, or an ought not. This change is imperceptible; but is however, of the last consequence. For as this ought, or ought not, expresses some new relation or affirmation, ’tis necessary that it should be observed and explained; and at the same time that a reason should be given; for what seems altogether inconceivable, how this new relation can be a deduction from others, which are entirely different from it. I sometimes find myself giving advice. I sometimes wish I could just stay descriptive, noting my observations, but not continuing on into advice-giving territory. I sometimes wish I could cut the advice from the observation. But, truth be told, I’m really mostly okay with it. I think it’s justified. For starters, I mean, really; for decision makers that seek to solve problems; for managers that need to guide action and course correct direct reports; for leaders that set direction and drive results, and for consultants that are supposed to have all the answers; when I’m in these roles isn’t it my job to communicate what ought to be done on the basis of statements about what is? And how about when the conversation is about goal attainment? In other words, if you have a goal to accomplish something, and I know what you need to do next to move toward the accomplishment of that goal, then doesn’t it follow that I should share what I think you ought to do? And how about when you make a commitment? Making a commitment seems to justify sharing “oughts” without much of an explanation at all, don’t you think? So it seems Hume’s Guillotine isn’t necessary. It’s okay to move from “is” to “ought”. The first situation is when you really don’t have a solid handle on the facts. If your “is” statement is iffy, you have no business moving into “ought” territory. You have more work to do figuring things out first. 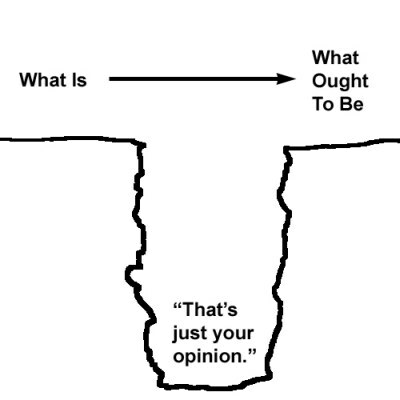 This may require a checking of the ego … especially if there’s an expectation that you share your opinion! The second is when advice is simply not wanted. Because, to be sure, while “is” statements are about facts, “ought” statements are really just opinions. You may not want my opinion. Even though they might be well-informed opinions; even valid opinions. But that doesn’t mean that they’re wanted. I ought not assume. I ought to ask. Perhaps Hume’s Guillotine is necessary after all. So now we get philosophy! Hume’s Guillotine is needed to remind us not to be lazy. We make the leap from “is” to “ought” all too frequently without even being aware of it, and yet it can have a great impact on our relationships. As a manager of people, a parent, etc. I’m certain I make the leap with nauseating regularity. Unless invited to, of course.